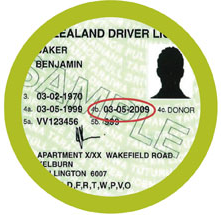 You need to renew your photo driver licence every ten years, on or before the expiry date. NZTA will send a renewal notice before your licence expires if they have your current address - you can update your address at any time by contacting the NZTA. The information below is a guide to renewing or replacing your driver licence. Number '4b' on the front of your photo driver licence will show you when your licence expires. Check number '8' on the back of your licence for the expiry date of any endorsements you may hold. Go to your nearest AA Centre, AA Driver & Vehicle Licensing Agent or Rural Mobile Unit to renew your licence. It will take approximately 15 minutes. We can't process licence renewals by phone or online. When you turn 75, you'll need to renew your licence. This licence will be valid for five years and you’ll need a medical certificate each time you renew your licence. In some cases, you may have to sit an on-road test. When you turn 80 your licence will be valid for two years. If you have questions about driver licensing rules or restrictions, please contact the NZTA Driver Licensing helpline - 0800 822 422. Check to see if you are eligible for a FREE in-car coaching session with the AA. When applying for or renewing any driver licence or endorsement, you'll need to prove your eyesight meets the required standard. You can undergo a basic eyesight screening check at your nearest AA Centre, AA Driver & Vehicle Licensing Agent or Rural Mobile Unit. The equipment used in the test is a screening device which 96.9% of all motorists pass each year. The remaining 3.1% may or may not have a problem with their eyes. If this is the case you'll need to provide an eyesight certificate from your doctor or optometrist. Go to your nearest AA Centre, AA Driver & Vehicle Licensing Agent or Rural Mobile Unit to replace your driver licence. For a holder of an overseas driver licence who wants to apply for a NZ driver licence to drive the same class or classes of vehicle. Find out how to complete your application through the AA. If you have questions about driver licensing rules or restrictions, please call the NZTA Driver Licensing helpline on 0800 822 422. Are you eligible for a FREE in-car coaching session? If you are an AA Member aged 74 years or older you are eligible for a FREE in-car coaching session with our AA Senior Driver programme!